I wrapped up my California research trip with a weekend in Yosemite. In my mind, Lick Observatory and Yosemite Valley are linked landscapes; it seemed appropriate to go from archives to the park. We did some quality star gazing out behind our cabin, but as frequently happens on vacation, I was ready for bed well before the darkest observing hours. Luckily, photographers like Gregg Cooper are out there doing the hard work while the rest of us are resting up. Enjoy this particularly successful photo taken at Valley View; it’s a lovely combination of moving water, the Milky Way, and the growing glow of sunrise. 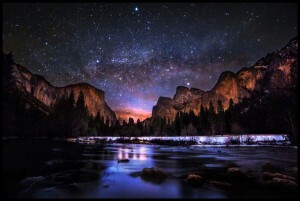 Click on the image to go to Mr. Cooper’s flickr page, where you can see this and other beautiful Yosemite photos. A letter from Captain Dewar, of 1st Cavalry, was read, reporting the discovery of a large stone in the Jhansi district, which, when struck, emitted a sound equal to that of the finest gong. The Secretary was requested to write to Captain Dewar, to ascertain from that gentleman, what he thought the probable expense of the removal of this stone to Delhi might be. The finest gong? Sounds like a meteorite to me, but which one? As far as I can tell, there were only 7 meteorite falls (observed falls) on the South Asian subcontinent before 1850. Four of those were L chondrite, two were H type, one was a diogenite. Those two H types could have had enough iron mixed with stone to make a bell-like sound if struck, but the mass of those falls have been located and removed to London (Akbarpur, fall 18 April 1838, found in Uttar Pradesh; Charwallas, 12 June 1834, found in Haryana). So, if Dewar was hitting a meteorite with his hammer, it must have been from an unobserved (or at least unrecorded) fall. In a list of 106 meteorites known to have fallen in India (both observed/unobserved falls) before 1926, only four of those were proper irons (GarhiYasin, Kodaikanal, Nedagolla, Samelia). Based on date of observed fall/discovery location, none of those could be the Jhansi meteorite. None of the remaining 102 meteorites on the list make good candidates, either. Unfortunately, I could find no record of the stone being shipped to Delhi. The Proceedings seem to come to an end with the issue I have in my office (January 1953); I’ve lost the meteorite’s trail. It’s indeed a puzzle, the solution to which is probably buried deep in the Museum of Natural History with every other meteorite collected by the British during the colonial era.